Below are answers to some questions that are frequently asked regarding our site, submissions, contributors, collaborations, and more! Please read below to see if your question is answered! What is Thirty On Tap? 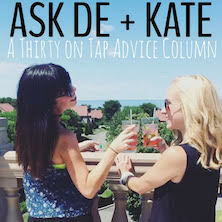 Thirty On Tap is a lifestyle blog that was started by two sisters (in-law) who wanted to carve out a corner of the interwebs for the older millennial. This site is geared towards the late twentysomething / early thirtysomething who might still be figuring some things out. Who runs Thirty On Tap? 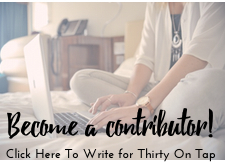 Thirty On Tap is run by De & Kate, who are two bloggers/writers living in the New England area. They produce, edit, format, and publish everything on the site, and they write a lot of the content as well. Is Thirty On Tap on Social Media? At Thirty on Tap, we moderate the comments in order to filter out harassment and hate speech. Basically: we welcome a variety of opinions but we’re not into being mean to one another. Please be respectful. I have a piece that I would like to submit to Thirty On Tap. How do I do that? Visit our Submissions page. You will find our Submission Guidelines that talk about style, tone, and word length, as well as a form for you to send your article. Why wasn’t my article published? We are very grateful that Thirty On Tap has spoken to so many writers and readers alike. Due to the volume of submissions that we receive, we cannot run every single one. There are also many reasons that an article doesn’t run, and none of them mean that your writing is bad! Sometimes an article doesn’t appeal to our audience, and sometimes it’s because we’ve received multiple articles on the same topic. What is the difference between the Submissions and Contributor forms? At Thirty On Tap, we welcome cold submissions – meaning, if you already have a piece that is fully written and finished and would like to submit it for consideration, you can do so. Additionally, we are also building a network of regular contributors. These are writers who receive our monthly topic/headline list that covers all of our current targeted themes. 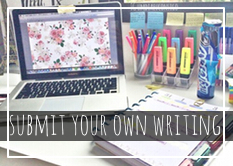 If you would like to apply to become a regular contributor, you may do so here. We strive to hit a minimum of approx 600 words. That said, lists tend to be shorter. Thinkpieces tend to be longer. We’re flexible! Can I submit pictures for my article? We tend to choose the featured images for the articles, mostly to give our site a streamlined, consistent look. If there are images that you feel should be included in your piece, please send them along as a zip file via email. My article was published. Yay! Can I publish it on my own blog too? We have received a lot of emails asking if we would be willing to update a past article with a link back to a company or brand; unfortunately, retroactively adding links to published articles is not within our practice. Additionally, if you represent a brand and are interested in collaborating on content, please email us with ALL of the details in your initial email. I represent a company. Can you send us a media kit? Sure! Head over to our Contact Page to fill out the form and we’d be happy to send along that information. Would you collaborate on a giveaway? We would definitely love to collaborate with companies and brands that are of relevant interest to millennials (particularly women.) Please visit our Contact Page to learn more! I run another blog/site. Can we collab? Contact us and let’s chat about it! Can I reference Thirty on Tap in an article? Yes, of course. Please link back to us and credit accordingly. Didn’t see your question? Feel free to contact us and we’ll get back to you soon!